The nature of racism in the United States has transformed from overt prejudice and blatant discrimination to more covert, embedded, ambiguous manifestations called racial microaggressions (Constantine, 2007; Pierce, Carew, Pierce-Gonzalez, & Willis, 1978; Sue, Capidolupo et al., 2007). Researchers have demonstrated the unique, harmful, and cumulative impact of racial microaggressions in the lives of people of color (Rivera, Forquer, & Rangel, 2010; Sue, Nadal, Capodilupo, Lin, Torino, & Rivera, 2008). By way of primarily qualitative, exploratory research, scholars have found that Black students' experiences with perceived racial microaggressions are linked with negative psychological and physical health, educational, and career performance (Greer & Chwalisz, 2007; Solórzano, Ceja, & Yosso, 2000; Watkins, LaBarrie, & Appio, 2010). Despite these findings, some Black students appear resilient in toxic microaggressive college environments, while others seem negatively affected. 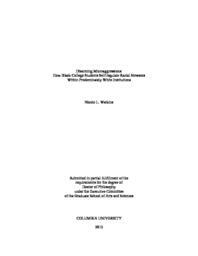 To gain insight about factors that cultivate resiliency and buffer against negative outcomes, the following study utilizes a quantitative methodology to examine (a) how Black students navigate microaggressive and culturally incongruent environments in predominately White colleges, (b) the role of social support in buffering their experiences, and (c) various self-regulatory styles employed in reaction to the academic climate. Implications of this study will contribute to research, theory, and educational practices as it applies to the promotion of culturally congruent college environments and the diversification of the academy.